As an environmentally conscious company, Induchem is continuously working towards a sustainable, better future. We believe that it is the initial small steps which become larger strides in reducing our carbon footprint. According to a recently published report, approximately 2 million disposable coffee cups are sent to landfills in Ireland on a daily basis. It is also well documented that not all of these disposable cups are recylable or compostable which has a major impact on our surrounding environment. It has also been suggested by Minister for the Environment Denis Naughton, that there may be an introduction of a disposable cup levy to help combat this figure of 2 million. This figure in conjunction with the global rise in coffee consumption could have a disastrous effect on our delicate ecosystem. 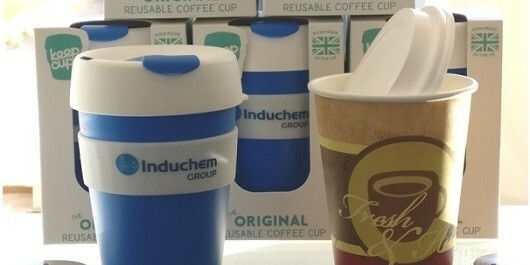 By leading from the front, our staff have designed and created company branded reusable coffee cups in order to combat this growing problem. This has resulted in a 60% company-wide reduction in the use of disposable coffee cups and materials over the last four months. This small but effective change along with our other eco-friendly practices, has helped to propel Induchem Group as a forward thinking, environentally aware company. Great changes start with small steps and we are always looking to improve our business, community and environment starting with employee led initiatives!